ISLAMABAD: A consortium of Chinese investment companies met Prime Minister Nawaz Sharif on Friday and announced to bring $3 billion in investment funds to Pakistan. Expressing its satisfaction with Pakistan’s progress in infrastructure, energy and development, the Chinese delegation lauded the country’s economic revival and said Pakistan was fully ready as well as capable of absorbing and capitalising Foreign Direct Investment (FDI). The visiting delegation also voiced its intent to explore the possibility of starting a new airline in Pakistan. The consortium said it is actively pursuing investments in infrastructure, power, aviation and tourism sectors of Pakistan. “We fully appreciate the vision of Prime Minister Nawaz Sharif which enunciates that economic prosperity is an offshoot of infrastructure connectivity and self-sufficiency in the energy sector,” the delegation stated. Prime Minister Nawaz Sharif said on the occasion that Pakistan’s economic outlook has changed altogether in last three years, which is being acknowledged globally. He pointed out Pakistan is among the year’s global top 10 improvers in Doing Business 2017 report. He added that Standard & Poor’s (S&P) has also upgraded Pakistan’s ranking from B- to B. The Prime Minister said that inflation is consistently on a downward trend and reduction in petroleum prices has also helped in decreasing inflation, with foreign exchange reserves increased to over USD 24 billion. He said the country’s investment policy has been designed to provide a comprehensive framework for creating a business environment attractive to FDI. The Law of Special Economic Zones (SEZ) has been made to meet the global challenges of competitiveness to attract FDI, he said. Warmly welcoming the delegation, the Prime Minister appreciated the Chinese delegation’s interaction with Ministries of Finance, Petroleum and Natural Resources Secretary Water and Power and Capital Development Authority. On the China-Pakistan Economic Corridor (CPEC), the Prime Minister said it is a game changer that is going to transform the lives of billions of people of the region. 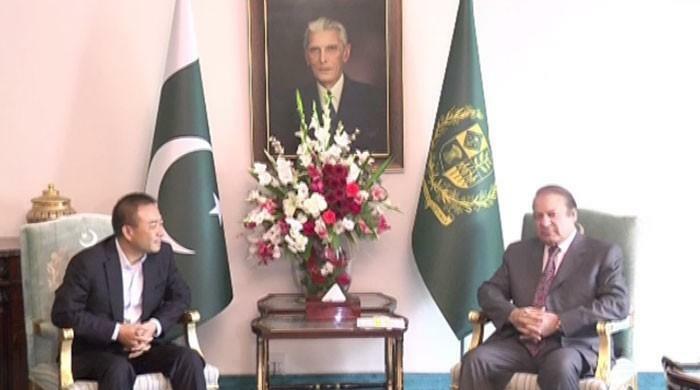 The Prime Minister expressed hope that the Chinese delegation would have a productive visit after the briefing on the immense potential for investment in Pakistan’s infrastructure, development, energy and communication sectors. He further expressed his gratitude to the leadership and people of China for their strong all-weather support for Pakistan through and through.